The Kingpin 88 combines classic style with Evenheat design and performance. Special colors now free !!! The Kingpin 88 is perfect for metal clay, jewelry and glass firing and is equipped with 15 preset metal clay programs (5 for BRONZclay and COPPRclay, 5 for Art Clay and 5 for PMC) along with 4 user defined custom programs for glass, beads and general firing. Match the color of your new Kingpin 88 with your personality by choosing one of our 11 available colors at no additional charge! 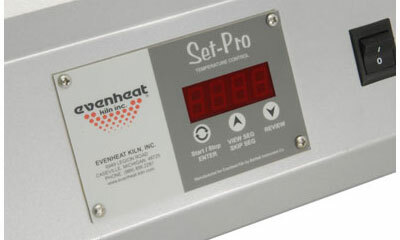 The Evenheat Kingpin 88 kiln is equipped with our Set-Pro, 3 button control. The Set-Pro is loaded with 10 pre-set metal clay firing programs for quick and easy programming. Presets include 5 for use with Art Clay and 5 for use with PMC. The Set-Pro also contains 4 user programs that allow you to decide the firing details. Perfect for all types of work including glass, glass beads and general firing. As with all of our controls, the Set-Pro is manufactured exclusively for Evenheat by Bartlett Instrument Company in Iowa. Bartlett enjoys a well deserved reputation as the finest control supplier on the market. They perform very well indeed. The control on the Kingpin 88 is positioned at a friendly viewing and programming angle. It's a thoughtful design feature and a detail you expect from Evenheat. The exterior of the Kingpin 88 is finished in an attractive powder coat finish. Powder coating is a finishing method that provides great looks with greater protection against scuffs and scratches than paint. Powder coating has the added advantage of being environmentally friendly to apply. Kingpin 88 color choices include Original Silver, Gold Rush, Copper Mine, Silver Vein, Salsa, Mancini, Bone, Empire, Envy, Seafoam and Pendant. The Kingpin 88 is offered with a bead door for those who also want to anneal glass beads. The bead doors on the Kingpin 88 feature a wide 7-1/2" opening as well as 15 mandrel teeth for maximum use. The bead door also features a soft, flexible fiber seal that forms slightly around the bead mandrel for added stability. We've designed the Kingpin 88 with a non-metallic, Cool-Touch handle that stays cool throughout the firing process. The heating elements of the Kingpin 88 are completely embedded within the chamber fiber for safety. Especially important with Bead Door equipped models. The heating elements of the Kingpin 88 are located along the left and right side of the firing chamber. This design provides for excellent temperature distribution throughout the kiln. The Kingpin 88's firing chamber is "personal studio" sized allowing the artist room to fire multiple pieces at once. The Kingpin 88 is designed for use on standard household voltage and current. Simply plug into any dedicated household receptacle and you're ready to go. The firing chamber of the Kingpin 88 is vented and is equipped with a vent plug. Venting is desirable during many heat processes, particularly lost wax casting. Order your Kingpin 88 with the optional Viewing Window. The Viewing Window provides a chamber view without having to open the door. You'll love it! The enclosure on the Kingpin 88 is well ventilated to keep internal control components cool and operating properly. Strategically placed inner baffles act as additional protection against heat. Longer life, high reliability: solid design makes a difference.